Monday July 24th 1899 I did some sewing today besides the cooking. The boys put in a big days work getting in hay. It was a very warm day. Tuesday July 25th 1899 Luther helped me wash this morning and I did bread baking. I ironed in this afternoon and Aunt Ellen and the girls were here a little while. 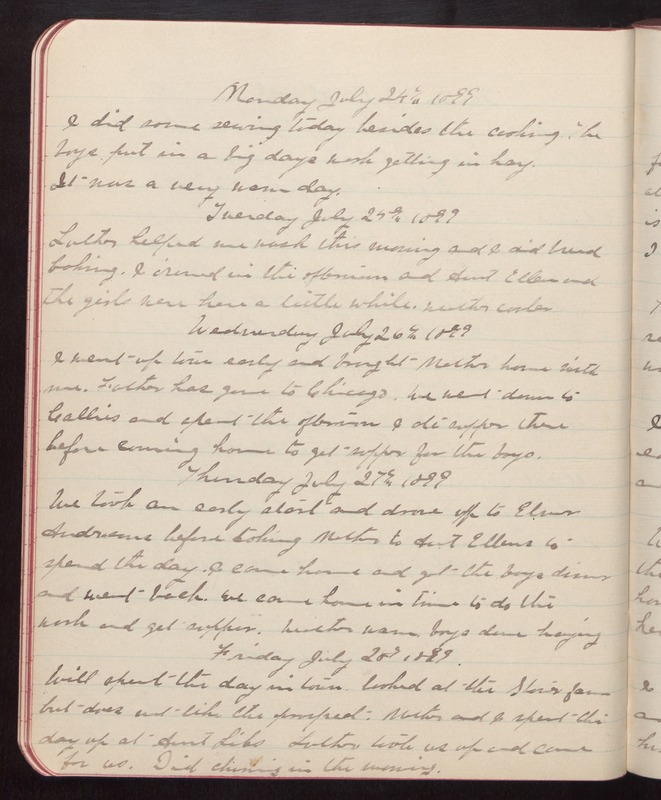 weather cooler Wednesday July 26th 1899 I went up town early and brought Mother home with me. Father has gone to Chicago. We went down to Callies and spent the afternoon I ate supper there before coming home to get supper for the boys. Thursday July 27th 1899 We took an early start and drove up to Elmer Andersons before taking Mother to Aunt Ellens to spend the day. I came home and got the boys dinner and went back. We came home in time to do the work and get supper. Weather warm. boys done haying Friday July 28th 1899 Will spent the day in town. looked at the [Stover] farm but does not like the prospect. Mother and I spent the day up at Aunt Libs Luther took us up and came for us. Did churning in the morning.